MINIMUM BOOKING, TWO NIGHTS FOR TWO PEOPLE MINIMUM BOOKING, THREE NIGHTS FOR SINGLE PERSON The price is £40 pr night for ONE person and £20 for extra guest. Total for 2 people £60 pr night. This includes sole use of house apart from the basement where we reside, so are on hand if needed. We are able to accomodate three of either the same family or friends, with one person sleeping in the small study on a Put U up Bed, who would then share bathroom. Price to be agreed. Study is adjacent to the bathroom and on the same floor as the main bedroom. Study has a stunning view to wake up to. Skipton is known as the "Gateway to the Dales" and is listed as the No 1 best place to live in Britain according to the The Sunday Times 2014 A great place for walkers, serious or otherwise. Should you not want to go to the Dales there is moorland in Skipton as seen from our study window and elsewhere in Skipton. We have a very small but cosy house in a quiet location on an incline off Raikes road, despite being so close to all the amenties one expects in a town. This is a peaceful area of old Skipton where one would hear the odd hoot of an owl, screech of a fox, mooing of cows, bleating of sheep. The latter can be viewed from the garden. Beautiful views, from sitting room and from the study one can see the moors & woods. 4 mins walk from High St, considered the best in UK according to BBC. Radio 4. Also Skipton has been voted by The Sunday Times, the best place to live in the UK. Extensive & lively, colourful market, 4 days a week in nearby High St. For those who love antiques, there is three floor shop, full of unusual items within a few minutes walk. There are also further very individual antique shops in the town. Skipton has so much to offer, 2 Theatres, Cinema, Museum & Modern Swimming pool set in parkland. Children's play areas, also Golf Course adjacent to park. Canal walks, Canal Boating, Boat hire. Woods surrounding the medieval, 11th Century Castle which hosts events during the summer months. Interesting 12th Century Church, the latter two, within 4 mins walk of house. Many good restaurants (we have counted 51 eating places within walking distance) offering Indian, French and Chinese dishes. Renowned Fish & Chip establishments. Loads of Coffee Houses & pubs nearby, including 94 restaurants. Excellent shopping facilities with many small original shops, selling all manner of goods. Museum & Art Gallery, Dave Ferguson's Hiring Cycle shop opp M&S. 2 large Supermarkets & Marks & Spencers food hall. Now even a "Poundland" recent addition, all within easy walking distance from house. Regularly held, extensive Saturday Craft & Flea Market in Town Hall in High St, only a few minutes walk from our house. We offer a B&B for a couple or a single person, (We are able to house a third person if required on a Put U Bed bed in the study) in small but clean & comfortable room with, TV Radio, Various Teas & Instant or Real Coffee making facilities. Towels & linen provided. We do NOT provide HOT/COOKED breakfasts but we do provide substantial Continental style fare with home made bread and a good and varied selection of foods which are available at times to suit our guests. Use of study if required. Wifi Use of kitchen Plenty of towels provided. If a bath preferred, can always use ours in our downstairs flat. No smoking permitted in house but smoking in garden OK Two friendly cats and 2 friendly hosts who enjoy looking after and meeting people from all over the world. We are on hand for any help or information you may need, by intercom house phone. Our small house is located off Raikes Road, 2nd sharp turning at bus stop. This little road is not on most maps. 10 mins walk to railway station and 8 mins bus station. Buses (short rides) to nearby Dales villages. Leeds & Bradford, all within easy travelling distance by train or bus. Manchester Bradford Leeds all within driving distance TOM, ANNE, ROBBIE & LONZO (the cats) Look forward to making you welcome. Wi Fi Internet, TV, Piano, Sittingroom, Garden with sitting out area with lovely views. Kitchen, Crockery and kitchen utensils. Washing machine. Space for drying clothes in garden. Study, Bathroom, towels. Small Double bedroom. Piano, plenty of reading matter very varied book selection WIFI. Computer As much or as little as our guests would wish. We are around most of the time for a chat. Housephone intercom for any help. It is an exceptionally beautiful place to live as well as being so convenient for shops. Markets 4 days a week in High St. Farmers market 1st Sunday every month. Lots of individual shops. Swimming pool, sauna & gym, golf course, all set in park 10/15 mins walk from house. Plenty of cafes & restaurants. Depends where you want to go what sort of break you are having. 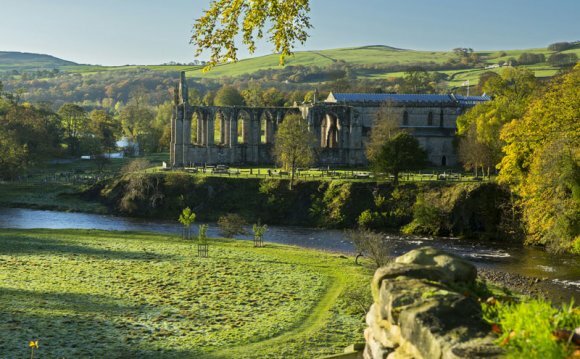 Loads of walks, Public transport to Leeds Bradford, Grassington Malham, Ingleborough for caves, Kilsney Park for fishing, Bolton Abbey, Historic Houses & Gardens There are many short walks of interest from the house. Castle, canal, boat rides, woods, walks, markets, 3 supermarkets. M&S food store, Antique shops. Chain stores as well as many individual shops. Many outdoor clothing shops. Plenty of eating and coffee establishments. 4 churches. 1 Catholic, 2 C of E, 1 Methodist.